The Pantheon Theatre was a reconstruction in 1824 of the Dominion of Fancy, a building first erected in the 1820s as a home for the exhibition of Dioramas and home to grand balls and society parties. John Scott, who had previously owned the Pantheon Theatre in London, moved to Liverpool in 1824 and set about having the first floor of the Dominion of Fancy converted into a Theatre. The Pantheon Theatre, as it was named on its opening the following year, 1825, is notable as being only the second Theatre to be constructed in Liverpool, the first being the 1772 Theatre Royal on Williamson Square. The Pantheon had a small stage and an auditorium capable of accommodating nearly a thousand people. The entrance to the Pit and Boxes was in Church Street. At first the Pantheon was only operating for the winter season so when it wasn't presenting drama it was home to other functions such as Madam Tussaud's Waxwork exhibitions. In 1829 the Theatre was taken over by Richard Malone Raymond and W. J. Hammond who were regular Theatre Royal performers. They changed the name to the Liver Theatre and it was soon to become a popular house for Liverpool's theatre going public. However, a dispute arose in 1836 with Mr. Clarke, the owner of Theatre Royal which was a Patent Theatre, when Raymond staged a production of 'The Rivals' at the Liver Theatre, this had previously been performed at the Theatre Royal and Clarke objected to its unlicenced revival at the other Theatre. The dispute didn't finally come to a satisfactory end until 1843 when Raymond's energetic protestations over his Theatre not being licenced as a Patent Theatre when the Theatre Royal was, culminated in the Regulation of Theatres Act being passed which ended the ancient Patent Theatres Act, which had for so long protected licenced Theatres at the expense of all others. The Liver Theatre became the first in England to be licenced under the new Regulation of Theatres Act and its name was changed to the Royal Liver Theatre to celebrate the occasion, opening on the 9th of October 1843, ironically with another production of 'The Rivals' which is what had started the whole dispute some seven years earlier. Clearly Raymond was elated to have been the instigator of such a dramatic change to England's Theatre Regulations. Despite all this the first few years of well received Drama didn't last long and by 1848 the Theatre was putting on much lower classes of entertainments to fill the seats. Above right - A Pit Ticket for 'Mr. 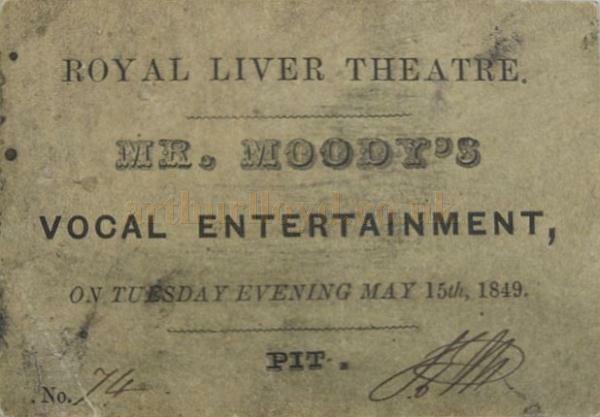 Moody's Vocal Entertainment' at the Royal Liver Theatre on Tuesday Evening, May 15th 1849 - Courtesy Dave Hamilton. The Last Manager of the Liver Theatre was Robert Edgar whose own short reign ended in 1850 when the building was converted into a Drapery Store which would remain there until the early 1900s, after which it was converted into a music shop and would never again be home to live Theatre. Much of the information on this page was gleaned from the excellent ' The Liverpool Stage' by Harold Ackroyd 1996.